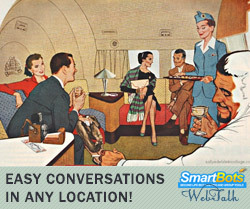 Do you know what SmartBots WebTalk is? This is an HTML snippet you can install to your website and display your Second Life group chat LIVE! Moreover, your website visitors can join the chat and send messages from the browser. We ensure the conversation security by asking users to login using any social network: Google+, Facebook, Youtube etc. We’ve changed the social login provider to the industry-standard one. That’s for reliability. We’ve slightly changed the web chat layout. That’s for a nicer look and feel. Finally, we’ve changed the snipped code: now it loads chat in background. That’s for your website to load faster. You can read more about WebTalk by visiting our documentation page. Oh, and this snipped is free when you are using the Group Chat Control service! P.S. 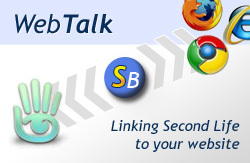 If you already have a WebTalk snippet installed on your website, the new chat version will be used automatically. However, you may want to replace an HTML code to a new one, with an asynchronous load. This new code can be found in your SmartBots account. The completely new, brand and unique tool has been launched by SmartBots: WebTalk. This tool allows you to connect your web activity with Second Life, and allow your web visitors reading and talking in your Second Life group. Web visitors authenticate themselves using Google, Facebook or Twitter account. Thus, logging to Second Life is not required at all. WebTalk remembers the SL name of the authenticated person and will use it next time automatically. Q: How can I put WebTalk on my website? A: This documentation page explains the WebTalk setup. Basically, you get HTML snippet code and put it on your website. A: We’ve paid a lot of attention to the safety of the WebTalk. 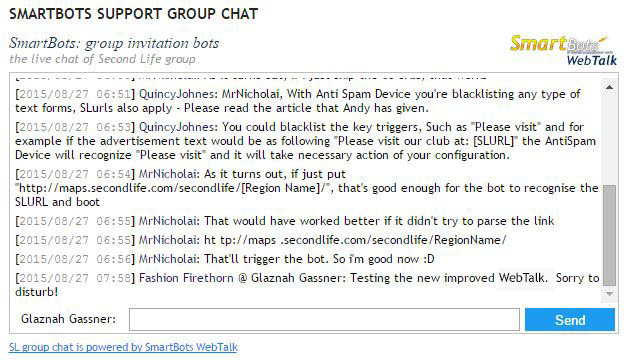 Besides the automatic spam checks, you can mute any user of the web using SmartBots Group Chat window. Q: May I change WebTalk window appearance? A: Yes, you may apply your own CSS file over WebTalk window, changing the appearance. Refer to this documentation page for details. Please proceed to official WebTalk documentation page to see the screenshots and know more. The working WebTalk chat is also available at SmartBots contacts page.